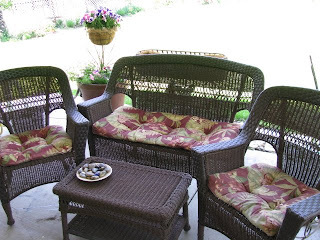 My "slipcovered" cushions make for a more relaxed feel. It's not "store bought perfect" but I think it's beautiful! good for you--now that's a way to save $$ and look good. I wish I had that pretty set! Love the use of the crib sheet! Hi Joy! 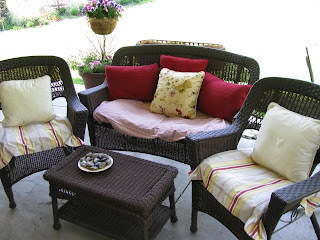 I love the relaxed look of the cushions. And the color combination is beuatiful! Great job and so creative! Great job creating creative solutions!!! Oooooh, the "after" IS cozier--very inviting!! I love it!! wow, your good. It looks so cozy and inviting! Looks great to me. I know how you feel. It is always good to inexpensivly redo things. Great idea! And how easy it will be to throw in the wash when needed now!